Nature knows when things go of hand. It might just instinctively react to a situation and forest fires could be nature's way of regaining control. Perhaps, an attempt to preserve precious resources and to make way for a new generation to grow unhindered. The wild growth of lantana in our jungles are a nuisance to both the wildlife and small plants and saplings trying to push it's way towards the nourishing sun. 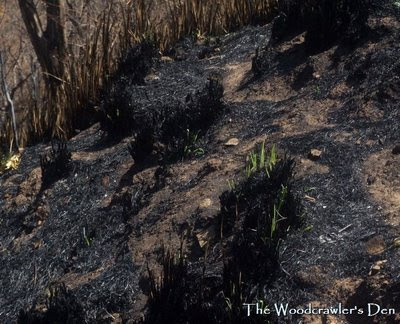 Maybe fires have a role in the cycle of life, but what if the fires are man made? It goes out of control destroys every bit of life in its path. 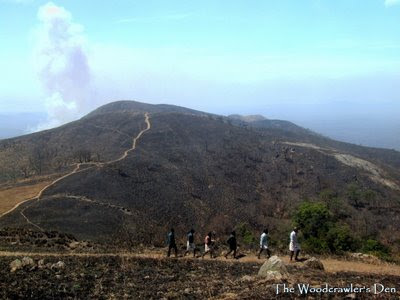 There is enough evidence to show that all fires in the Bandipur National Park and contiguous areas are not due to global warming as everyone is fond of saying. As our team from KANS surveyed the destruction before us we saw a group of six individuals moving out of the forest along the exposed track. Three of them were smoking!! 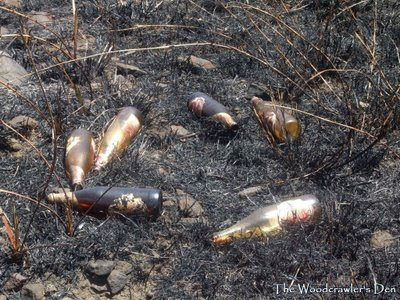 Further evidence of revelry was seen in the burnt grass. Beer bottles and empty cigarette cartons thrown by callous tourists. Even a condom was present among all that ash!! 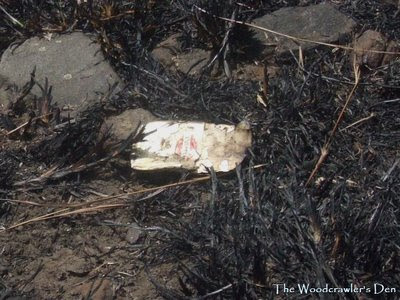 A carelessly thrown match or cigarette could be the cause of the fire. Unless some sort of control in imposed on movement of humans, especially senseless tourists this sort of "accidents" are always a frequent possibility. As a matter of fact , the possibility of such fires becoming more frequent is a reality due to unrestricted promotion of tourism. thanks for this ppost..its sad but we have to spread awareness on the issue..